Deputy First Minister Martin McGuinness today expressed hope that Northern Ireland will soon have its first ever papal visit. After attending Mass at St Peter's Basilica in Rome following the installation of Cardinal Sean Brady, Mr McGuinness said a visit by Pope Benedict XVI to the province would be warmly welcomed by Catholics and Protestants. And he also noted the considerable interest in Northern Ireland's peace process in the Vatican and the goodwill that existed in the Church towards Stormont's power sharing government. "I have no doubt for one minute that the prospect of a visit by Pope Benedict would have been raised in Cardinal Brady's conversations with the Holy Father over the course of this weekend," he said as he prepared to leave Rome. "What was discussed is obviously a matter for them but there has been a lot of talk about the prospect of another Papal visit. 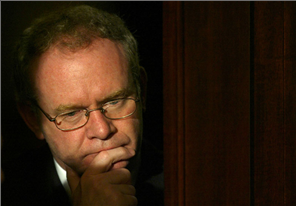 If such a visit were to happen I think it would be regarded as a particularly joyous occasion," Mr McGuinness said. The Stormont minister insisted it did newly elevated Cardinal Brady a disservice to suggest he had been honoured solely for his peace and reconciliation work. "His meeting with Ian Paisley was an important step along with all the other steps which have contributed to re-establishment of the political institutions," Mr McGuinness said. President Mary McAleese, who was also in Rome for the ceremonies, said yesterday she would welcome a visit to Ireland by Pope Benedict. But she insisted it was a matter for the Church authorities and that it was not for her to extend such an invitation.